who doesn’t love a big wreck? “Incident before Canning HWY right lane closed” the sign read. Probably someone with a flat tire who didn’t make it to the emergency lane. I normally arrive a bit early at Rotorvation anyway, so I didn’t really care much about being stuck for a bit. After slowly creeping towards the exit to Canning highway, I could see a plethora of white and red flashing lights. This is starting to look like a serious incident! I started to get excited about seeing a nice big wreck to start the day. Let’s be honest, no one wants to see other people hurt, but who doesn’t love a big wreck? However, as I drove past the line up of roadside assistance vehicle’s and traffic wardens from Main Roads WA, I started to notice a lack of emergency vehicles. And soon enough I noticed the lack of the expected wreck. As I drove on, thinking they must have just cleared everything up, I noticed a medium-sized puddle on the closed off lane, followed by another one. A man was feverishly trying to find a way for the water to drain away. They closed an entire lane for a bloody puddle! To be fair it had been raining ridiculously hard during the night. As I walked into the kitchen that morning I noticed water all over the floor, coming from the front door. Somehow the wind had managed to force the rainwater over the wall in front of our door, yet also underneath the door itself. I’ve lived below sea level for 27 years, but this was the first time I actually experienced wet feet from bad weather. I still think it was an overreaction to bottleneck the freeway because of a meter wide puddle though. I know it’s a little unusual for me to write two blogs in such quick succession, but I owe you the story of what inspired me to be a pilot, and I’ve been focusing on the studying so much in my past few blogs, I hardly had room left to write about the other important things that happened. Like the time Emma and I went to Cathaven to drop off a big bag of old bed linen, and buy an entertainment book. Entertainment books are pretty cool, you support whichever cause you buy them from, and then get loads of coupons in return. Since we were there we had a little stroll past all the cats that were currently there (250 at the time we visited). All the way in the back, I saw a little white head looking at me, and as I walked over, he put the top of his head against the glass. Zoey does this to me when she says hi, and it means a cat trusts/loves you. As I went to look him in the eyes, another white fluff ball stirred behind him. 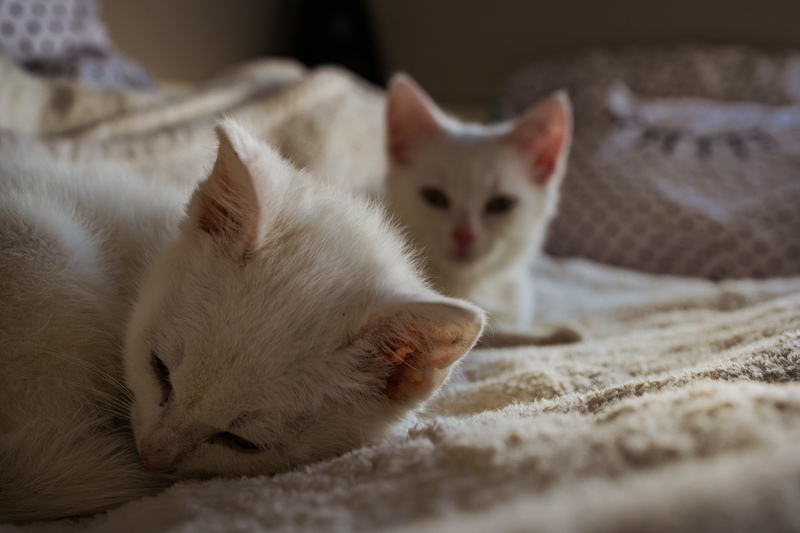 Well, to skip ahead a few minutes, we ended up leaving there with two little white cats, which means we now have a total of five cats. I was not entirely convinced we should adopt them, until I heard this huge unit of a woman slobbering about how she might adopt them, and a quick glance at her unkept appearance made me think “over my dead body woman”. So now I have to defend my food from two little piglets of cats, and once again be wary of where I place my feet, or sit down. But they are very lovely little creatures. Jackie seems more of a troublemaker, but perhaps that is because the world sometimes passes Wilson by, on account of him being deaf. Whenever I or Emma change out the bin liner for instance, all the cats make a run for it (we think they don’t like the noise), but not Wilson. If he has his back turned to you he just doesn’t realise. He has however found out that on top of my PC is normally a nice warm spot for a nap. But, back to the promise I made a few weeks ago. Why do I want to become a helicopter pilot? Well, I guess it’s a bug you catch. So a more interesting story is likely how and when I caught that bug. It was the winter of… I’m not so sure actually, I must have been in my early teens, so not long after the turn of the millennium. We were, as usual, in Switzerland, where my parents rented a small house somewhere on a mountain. It took half an hour to walk up the mountain from the car to the front door, if the farmer, who we rented the house from, had cleared a path for us. That winter saw exceptional amounts of snow fall. This resulted in the Col (mountain pass) leading out of the village to the South-East being closed down, which wasn’t all that spectacular, that happened most winters. This left us with the road heading North as the only way in and out of the valley. Again, something that is quite normal in Switzerland. What was out of the ordinary however, was the big Army helicopter slowly woop–woop–woop-ing into the valley one morning. I happened to be leaning out of the attic window to see what the weather would be that day, and waved at the door gunner. He waved back, probably content with flying without a big machine gun for a change. It turned out to be the first supply run into the village, and more would follow over the next few days. A known avalanche prone area had become unstable due to fresh snowfall, and effectively closed off the road to the North. The only people allowed trough were farmers who had full milk tanks that needed to be delivered to the cheese shop. And they were only allowed through one at a time with special location devices on board. Since our vacation was coming to an end, we tried to get a pass through with one of the devices, but since there was no actual emergency for us to get through, we were told to just wait it out like everyone else. Something I did not mind at all, I’d rather be trapped in the valley than trapped in a classroom. Unfortunately this was not to be the case. As a GP my father couldn’t exactly call in to work and not show up. So he arranged for a rental car at the other side of the avalanche prone area, and booked us in on a flight out. The local helicopter company understood the economical potential of a valley full of trapped tourists, and capitalised on that by setting up a temporary airbridge. I sat in the front seat, next to the pilot, and although it was arguably the shortest flight possible, it made me fall in love with the concept of the helicopter. The Aérospatiale SA 315B “Lama” is by no means a fancy looking helicopter, and it must have been the cheapest machine to operate the company had available, but it still made a huge impression on me. As I mentioned in my last blog, in the years to come since then I convinced myself flying helicopters was not to be for me. Something I had to strongly reconsider after my flight in 2016. Unfortunately for you, I’m already way over the 1000 words I normally try to not exceed, in an effort to keep my blogs from droning on and becoming too long to enjoy. So the story of when my passion for helicopters got rekindled will have to wait until next time. I promise I won’t wait as long as I did last time I promised to tell a story!